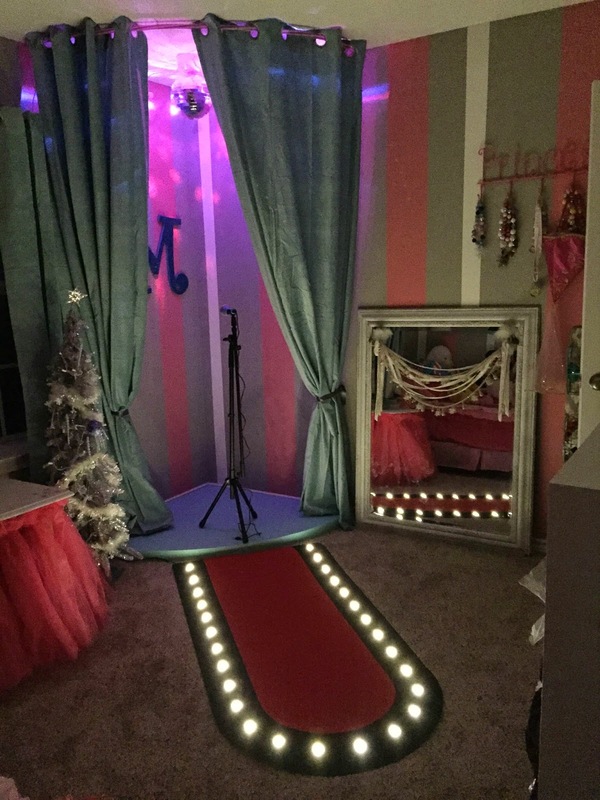 My Mom came across a great idea, to build a stage in Madison's room for Christmas. 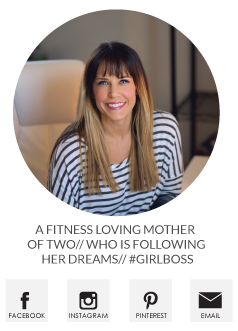 The child is a natural Aries and first born - loves to be the center of attention. She is me all over again, what can I say. The hard part was finding someone to build the stage and dress up clothing station, after almost getting ripped off by a scam artiest on Craigslist we asked a neighbor to build it for us. 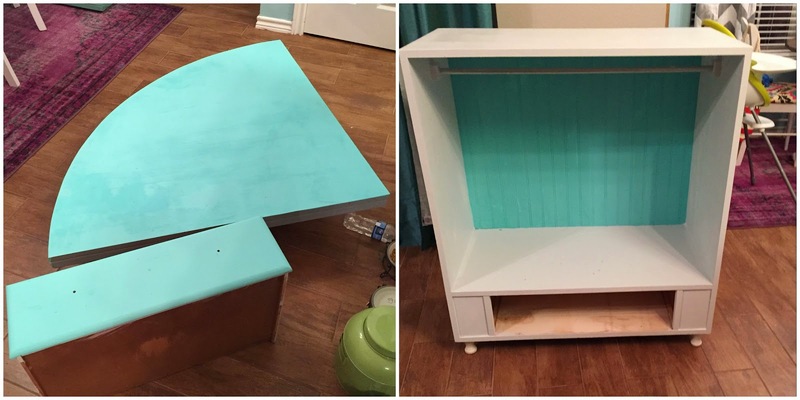 The stage is 42 inches and made to fit perfectly into a corner of her room and the dress up station he built to fit a certain wall in her room, but you could very easily convert an old dresser or TV stand we just ran out time trying to find one with the right dimensions. I painted them myself and added large crystal knobs to the bottom drawer. To pull this off we had her spend the night on Christmas Eve with my parents and Oliver and I had a few hours to get it all set up. The main problem we ran into was hanging the stage curtains, we found extra long ones at Ikea for about $50 bucks and in theory we through we could use a curtain shower curtain rod to hang them, no. I am so glad a friend mentioned using a hula hoop because I would of never thought of using one! We cut the hula in half and used rubber hooks to hang it from the ceiling, also when I say "we" I mean Oliver cause I was sick and useless. Her top request for Christmas was a 'real' microphone, so we got one and a stand a Guitar Center. 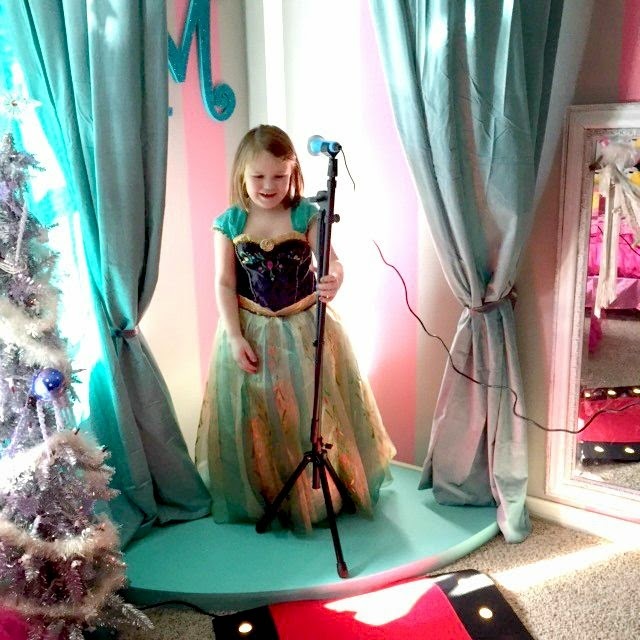 I moved the large mirror down to her level and hung her bows and necklaces nearby - this is probably her favorite spot - she loves to see her outfit creations after changing her clothes 4 times a day. The best part? It all lights up when the sun goes down! The disco ball and rug are both from Ikea, it like they just knew what I needed to really make it fabulous for her. That is awesome!!! I absolutely love decorating kids rooms, it is the best! To see their reactions and them enjoying their space is even better! Nicely done! ha ha! I see her in high school in all the concerts and theater clubs, probably cheer too. what a sweet heart. Really cool idea! Well done, Mom and Dad! Award for coolest parents ever goes to you guys!! This is amazing!!! That is so cute! I may have to make this for Ella's playroom! Megan, Where did you get the hairbow holder? I love it!! What an awesome idea!! This is literally the coolest idea ever. I love it. I freaking love it. That is the coolest gift ever! This is so awesome for a little girl! What great parents!